The Los Angeles County Library held a special dedication and grand opening of the city’s new library over the weekend. The new library is located on the first floor of city hall on Copley Drive. The city agreed to lease the space to the county library for $1 a year. The county contributed $5 million to turn the old call center into a state-of-the-art library. Find a photo gallery at OPENING. 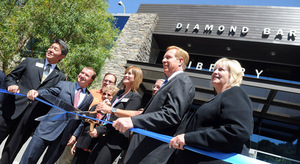 Diamond Bar had outgrown its old library on Grand Avenue and the 9,900-square-foot facility could no longer handle all the traffic. Last fiscal year, it was the eighth-busiest branch in the county, with 250,000 visits, according to library manager Jesse Lanz. And parking was at a premium with only 35 spaces. The new library offers more than 18,000 square feet, as well as 288 parking spaces.